The goal of the Civic Engagement Program is to give citizens the opportunity to educate themselves on the structure and policy issues of the City by shadowing and potentially serving on Boards, Commissions, and Committees. All who are interested will attend an information session and interview with the Community Partnership project. Once the interview is complete, program participants will submit the usual City application for appointment to boards, committees, and commissions with the City of Colorado Springs. The information session will provide more instructions on how to make this application. Upon approval from the Community Partnership Project, program participants will participate in an orientation to boards, commissions, and committees. The City Council Administrator will conduct this orientation. At the orientation program participants will have the opportunity to meet City Council members and other City Officials. Once the orientation is complete, program participants will proceed on one of two tracks. Track one is designed for program participants to provide a fresh look at major city issues. 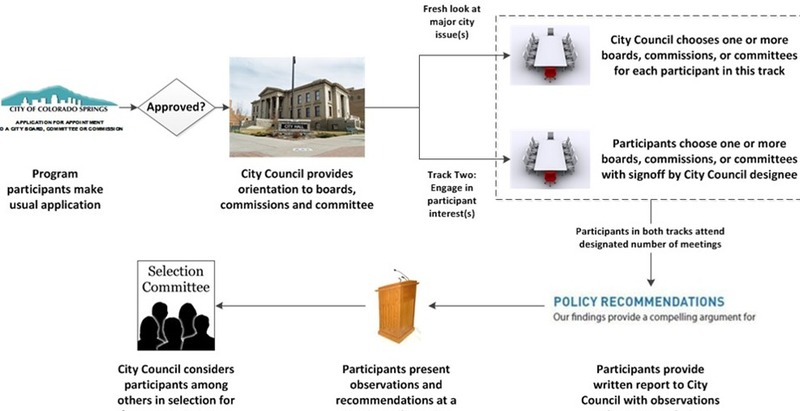 If participant does not know what board, commission, or committee they would like to serve on, City Council may choose one or more boards, commissions, or committees for the program participant in this track. Track two is designed to engage program participants in city policy issues of particular interest to them. Each participant will choose one or more boards, commissions, or committees with the approval of a Colorado Springs City Council designee. Depending on the time frame participants enter the program, the Community Partnership project will pay for each participant to attend the El Pomar Foundation ELDP “Board Governance Training”. After a designated period of participation in board, commission, and committee meetings, each participant will provide one of two items to the Colorado Springs City Council. A written report to the Council with observations and recommendations or a presentation of observations and recommendations at a designated City Council meeting. Below is a visual representation of how the program works.